The Reliable Brio Pro 1000CC is commercial steam cleaning system that comes mounted on a portable cleaning cart. Its most popular use at this time is to kill bed bugs in hotel and residential settings. The 17 piece accessory kit offers several tools that can be utilized to clean grout lines, restroom areas, and other sensitive areas. Steam deodorizes and sanitizes using no chemicals what-so-ever. If you're looking for a safe commercial cleaning alternative that is eco-friendly, healthy, and cost-effective, this is the unit for you! It's no secret that bed bug infestations are becoming more and more of a problem in today's society. Most individuals believe that the only treatment plans available are with real harsh chemicals and complete removal of infested materials. These have proven to rid the bed bugs, but they can be very expensive, time consuming, and complex. High temperature steam, like that offered by this model, will kill bed bugs at all stages of growth. 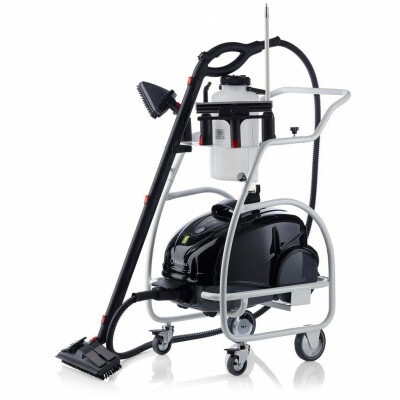 Reliable Brio Pro 1000CC bed bug killing steam cleaner is great for use in any residential, commercial, or industrial setting. For more economical models, like our handheld portable restroom steam cleaner, please take a look at our full line of steam cleaning & vapor steam equipment. 17 piece accessory kit for cleaning mattresses, carpet, hard floors, grout lines, corners, and other areas. The boiler produces 320° F, which outputs 250° F steam at the tip of the tool. Trolley cart allows the user to easily move the steamer around from area to area. A continuous fill bottle is located on the cart that you can fill when the steamer runs out for continuous steam. Eco-friendly option for commercial cleaning and ridding your self of a bed bug problem. Customers who were interested in the Reliable Brio Pro 1000CC Bed Bug Killing Steam Cleaner w/ Cart were also interested in the following items. This is a review for the Reliable Brio Pro 1000CC Bed Bug Killing Steam Cleaner w/ Cart.